While many people think that social media is a separate business function, this new form of marketing is just another marketing activity! And yes, marketing rules still do apply. Too many times business owners get caught up thinking they are behind in their marketing and that they need to be on social media. The business owner hastily makes a Facebook Page; but is at a loss for how to interact. Eventually the business owner abandons their Facebook page because “social media is not working for them.” The business owner failed to make a strategy for their new marketing endeavor. 1. Create goals for your social media. What is it that you want your social media to achieve? Increase fans? Increase sales? These goals should be S-Specific; M-Measurable; A-Attainable; R-Realistic; and, T-Timely. Example: Increase Facebook fan base by 10% by the end of May by developing engaging content and interacting with fans. A social media management role is ideal for someone who is good at interacting with people and possesses superb customer service skills. Despite the stereotypes, this position should not be limited to young professionals in their early 20s. While using social media can be free, it does demand significant time and resources for the ongoing maintenance. What is your organization willing to allot to this marketing component? Some organizations hire an individual full-time to manage their accounts, while others hire outside organizations to manage accounts (like me!). I hope that these three tips help you define your social media strategy! 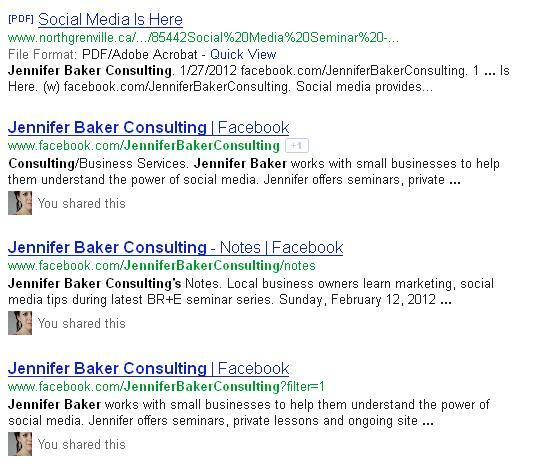 Tagging links the tagged page to a post (status update, photo, link, question or video) that you develop.Below is an example of Jennifer Baker Consulting tagging Sarnia Photography. The other page will be notified that you have tagged them in a post. Your post will appear on their page on the right-hand side. This will be visible to all visitors of that page. When it comes time to tag a business, insert the “@” symbol, and start typing the business’s name. Select the appropriate business name. The business name will be highlighted in a light grey box. This indicates that the name is now a hyperlink to that business’s page. LinkedIn, the only professional social networking service, was launched nearly ten years ago. Similar to an online, never-ending networking session, LinkedIn allows professionals to retain and maintain those valuable connections. Because seeking out and requesting to connect is a main component of LinkedIn, it is important to ensure that your public profile is adequately developed. Visit SETTINGS in the TOP-RIGHT corner. On the left hand side (see image) is a panel to choose how you appear when people search for you. 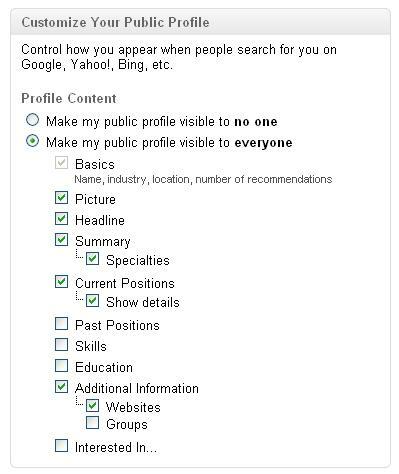 “Make my profile visible to everyone” – … otherwise you’re not searchable at all! “Picture” – A professional photo of yourself will help jog an individual’s memory of meeting you. “Current Position” – Indicating the organization that you’re currently with will help people recall the connection they have made with you. “Additional Information – Websites” – I always highlight the importance of drawing people to another site for more information. This can be a website, Facebook site, or blog. While you can choose to make your entire profile public information, I recommend highlighting only key details you would like potential connections to know. Facebook has gone and changed some components of Facebook business pages! While my husband and our friends were watching the Senators vs. Rangers game on April 18th, I was busy checking email… I mean watching the game. During this time I received a notification from Facebook regarding the changing sizes of page profile pictures. The profile picture that you use on your Facebook page must be at least 180 pixels by 180 pixels; however, it will display at a size of 160 pixels by 160 pixels. Since this is a square dimension, I recommend uploading a square version of your company logo. If your logo is not square, consider getting creative. 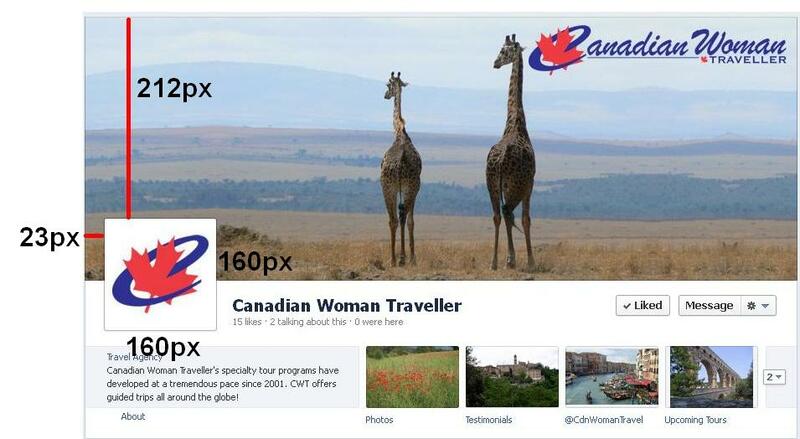 The Canadian Woman Traveller’s profile picture is a component of its original logo. The remainder of the logo can be found in their cover photo. Rectangular images will be cropped to fit the box – and this may not be the image you want your business to portray! As you may know, profile pictures display 23 pixels from the left side and 212 from the top of your cover photo. When you are designing a new and innovative cover photo it is important to take these dimensions into consideration, as you can play up the design!